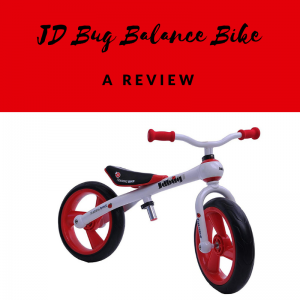 JD Bug is a brand well known for it's scooters but they also make brilliant balance bikes too. A sturdy but lightweight balance bike with realiable EVA foam tyres which is perfect for the 3 plus age group. It is extremely well designed and won the IF design award in 2011.It comes in red and white so is gender neutral. The JD Bug weighs 3.6kg. There are lighter bikes available but this is fine for the recommended age group of 3 plus. It's still super easy for 3 year old kids to move and control this bike. The chunky 12 inch EVA foam tyres give children a sturdy, safe and smooth ride. The handlebar can be adjusted to the right height for a child between 50 and 55cm which is quite a wide range compared to some other bikes. The seat height can also be adjusted between the measurements of 35cm and 40cm. There are other balance bikes which are similar quality but which have a larger seat height adjustments. For example the strider classic bike can be adjusted between 28cm to 42cm so could last your child that little bit longer and it costs about the same at £66. JD Bug also make scooters and as their scooters are of high quality and design so are their balance bikes. It has already been mentioned that this balance bike won a design award in 2011, so you know the bike is a good one. The maximum weight the bike will take is 25kg. The bike retails at around £69 but at the time of writing it can be picked up from around £66. If you're looking for a high quality bike at a mid range price for a 3 year old this could be it. The excellent design, chunky robust wheels, adjustable seat and height and low weight make it a great all rounder. A top choice of balance bike. Here are some other options of balance bike. Need a seat height with a wider adjustment range? Need something that weighs less? The bike is lightweight at just 3.6kg but again the Strider bikes are lighter at 2.9kg for the Strider classic and 3.6kg for the strider sport with the extra seat post. There are quite a few balance bikes you can get for less money. It's worth checking out the features of these balance bikes before you make a decision. Cheaper bikes can sometimes be a much poorer quality design and build. Quite often they can be heavier which makes it harder for young kids to control and use. A couple of options to consider are the banana balance bike. It's lightweight and has a great adjustable seat height between 31cm and 40cm. However, you can't adjust the handlebars which are at one height.